The backstory: A retired couple hired the architects to build their dream house along the Connecticut coast. Their plans included hosting visiting family members, entertaining guests and enjoying some peace and quiet for themselves.Scope of work: This was new construction designed from scratch. Style: The idea was to create a space that felt like a 400-year-old Normandy manor house that had been renovated. “The architectural design borrows from French provincial examples with symmetrical geometries and classically proportions unencumbered by ornate embellishments,” says architect Douglas VanderHorn. “We designed this professional-grade kitchen to look like an elegant installation within a vintage timber house.” They used antique textures to lend a sense of age. Function: The kitchen not only focuses as a spot for the homeowners to cook and hang out with family but also accommodates catering for large events. Layout: Since the house was new construction, VanderHorn thought carefully about where to place the kitchen and decided it would serve as a “hub” — a central gathering space. “It serves as the junction between mudroom hall, dining room, great room and various storage spaces,” VanderHorn says. The magnificent range backsplash and hood serve as a focal point between two tall windows. An island serves as a work area with a sink on one side and seating on the other. This photo was taken from a wall of cabinets that leads to the walk-in pantry; we’ll get there in a moment. VanderHorn also made sure to create open sightlines through the room and to leave generous room for circulation when laying out the kitchen. 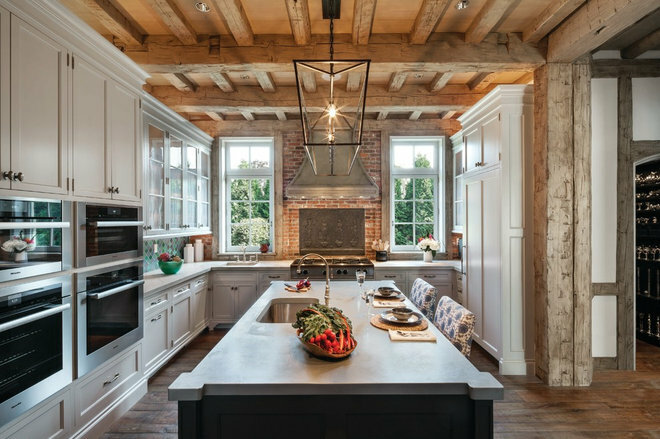 Walls: Post-and-beam architecture in the kitchen captures the look of a restored old French manor house. He filled in the walls with stucco and with handmade brick on the range wall. These textures create a well-worn, rustic look. Ceiling: The rustic look continues to the ceiling, which is composed of reclaimed timber girders and joists, along with quartersawn white oak planks. Flooring: These wide planks are 1-inch-thick character-grade oak floors. They are hand-scraped and have a tongue-oil finish. 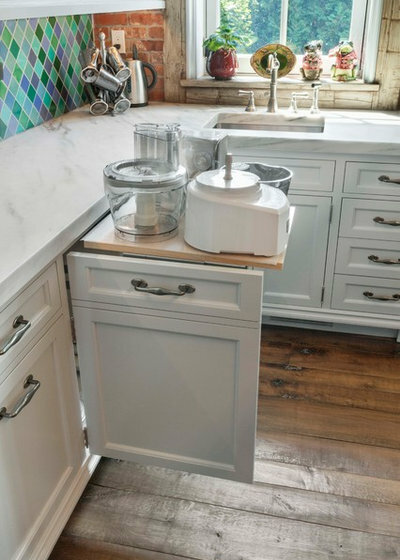 Countertops: The island has a zinc countertop, while the perimeter has honed Danby marble counters. Appliances: VanderHorn concealed the refrigerator and freezers behind cabinetry panels and drawers. There are two high-speed ovens and two conventional ovens. Range: The range has a custom zinc hood, a collaboration between the architect and Sarah Blank Design Studio. It conceals a modern exhaust fan. 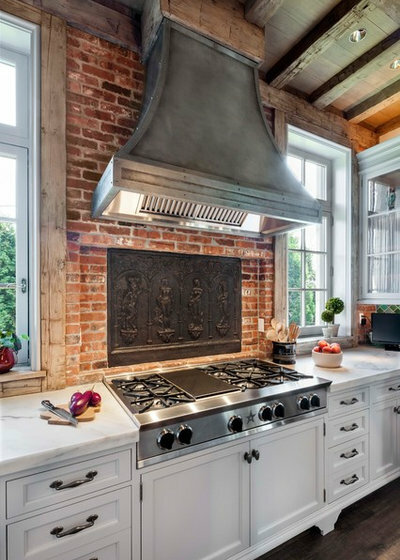 Homeowner’s great idea: “The owner found a one-of-a-kind antique cast-iron fireback that would have originally been used as a fireplace, and repurposed it as the backsplash for the range,” VanderHorn says. Cabinets: On the exterior, the cabinets are glazed and elegant, a contrast to the rustic timber framing, handmade brick walls and weathered wide-plank oak flooring. The knobs and pulls are satin nickel. Cabinet storage: All of the cabinets are hardworking. 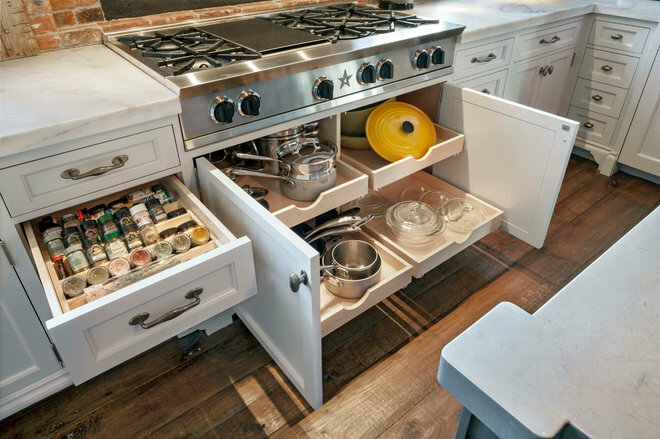 Sarah Blank Design Studio spearheaded the customization for smart, specific, well-placed storage. The lower cabinetry includes pull-outs for pots and pans right underneath the range, organizers for cooking utensils, flatware and spice racks, tilt-out drawer fronts near sinks for sponge caddies, roll-out bins for trash and recycling, slots for cutting boards and serving trays, appliance shelves, lifts and Kessebohmer MagicCorner technology. Pantry wall: These cabinets along the opposite side of the kitchen surround arch-top French doors that lead to the walk-in pantry. VanderHorn left a generous hallway-width space between this wall and the island for circulation. The upper cabinet doors have restoration glass and molded muntin bars custom-designed by VanderHorn. They also have two-thirds-height shirred interior curtains, which leave the top glass panes open to display decorative plates, service items and pottery. (You may have noticed this in the main part of the kitchen as well). Pantry: The 55-square-foot pantry behind this wall includes room for food storage; for small appliances like crockpots, food processors and pet supplies; for a Sub-Zero 24-inch glass door wine refrigerator; for grid-style wine bottle bins; and for canning and preserve jars. Backsplash: The backsplash brings in violet and green. It is a ceramic Mallorca mosaic tile. Lighting: The architect combined dimmable incandescent low-voltage room lighting and low-voltage cabinet and task lighting. 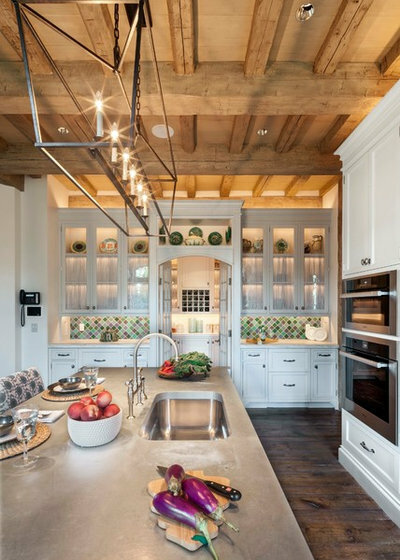 He centered a large, unfussy chandelier over the island. Potting room: Just down a hallway from the kitchen there is a mudroom and this charming potting room. While technically not a part of the kitchen, I simply could not leave it out. 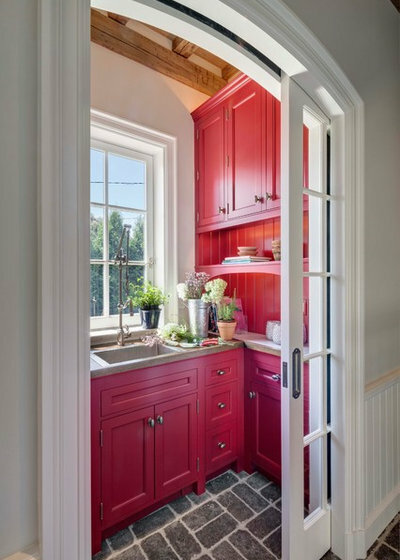 It has pocketing arched French doors, crimson red cabinetry, V-groove paneling, a stained-oak countertop and a hammered-nickel sink with a satin-nickel pot filler. VanderHorn centered the sink on a tall French casement window — the homeowners can look outside for inspiration while potting plants and scan for flowers to cut for arrangements.